During their two years with College-NOW students will complete a number of engineering projects. Students work in teams led by a project manager, and in conjunction with engineers at North Central State College and/or engineers working in industry. These are some examples of their work. The Arduino Bluetooth Robotic Car is a remote controlled car which has zero-turn capability drive by four motors. The students use an app on Android phones which allows them to communicate with and control their cars. Cars are equipped with head lights (two LEDs), tail lights (two LEDs), and a horn. An Arduino microcontroller is used to control the different electronic devices. 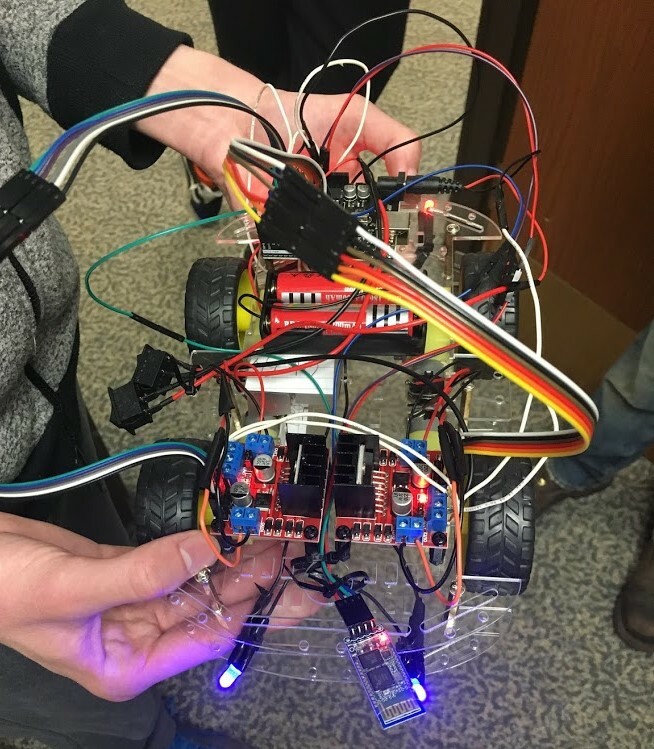 The purpose of the project was to give the students a hands-on example of building an electrical control circuit to apply skills they have learned in their electrical classes. Three of our College-NOW seniors will be headed to Malawi, Africa in December of 2015 to research and produce cook stoves. Their challenge is to make the cook stoves, also known as rocket stoves, more efficient, lighter weight, use local material, and improve the manufacturing process for the villagers of Malawi. Students are pictured below from left to right, Justin Leach, Carter Bishop, and Trevor Reed, with their prototype. For our project we have been working on making a binary clock. Binary is the language by which computers and all other electronic devices "speak." The translation of all letters, numbers, and symbols can be compounded into a group of 0's and 1's. The binary clock uses this representation to express the time. There are columns for the one's and ten's places for each unit of time (seconds, minutes, hours). Binary is counted as 2 to a power. In other words, the first LED (light emitting diode) represents 1, because 2 to the 0 power equals 1. Likewise, the next LED represents 2 and all following are sequentially multiplied by 2. As the first step in our project we built a few circuits in Multisim to make sure our design would work. Now, we are testing out the circuit on a breadboard. After that, we will switch to SMD (surface mount device) parts to condense the circuit’s size. These parts are much smaller because they are able to be connected to printed circuit boards with less prominent pins. Some devices, such as the LED's we will be using, do not even have pins. Rather, there are small metal connectors that are flush with the surface of the part. These can be easily soldered onto a circuit board. As a final step, we intend on mounting it inside of a plexiglass case. For our PBL project, we will be making a three dimensional printer. This printer will make 3D objects out of powdered Plaster of Paris. Being able to see a physical model can help designers see the function and use of a new product. The printer works by putting down a layer of powdered plaster. Next, an inkjet printer prints on top of the plaster. The platform that the plaster is laying on then moves down and another layer is printed on top of the first. When this is repeated, a solid part is made wherever ink comes into contact with the plaster. (The rest will fall away when the part is removed.) So far, we have built most of the main structure and have started to disassemble the inkjet printer we are going to use in the design. Also, we have attached motors to the threaded rods used to control the layer setting system and purchased the rail for the railing system.